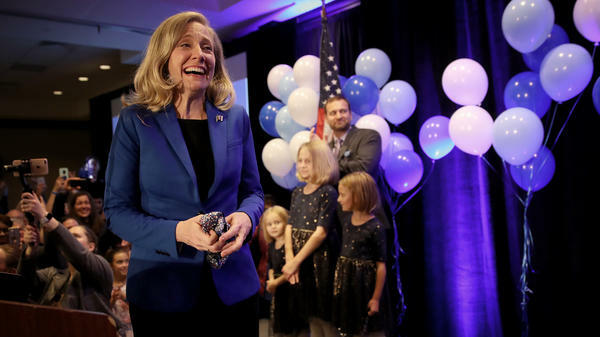 Abigail Spanberger, Democratic candidate for Virginia's 7th District in the U.S. House of Representatives, thanks supporters at an election night rally. Spanberger declared victory over Republican incumbent Dave Brat. That means at least 121 women will serve in the 116th Congress, up from the current 107. It will bring the share of Congress members who are women up from the current 20 percent to nearly 23 percent — a new high, but far from parity. These new records represent the culmination of a record-setting year for female candidates. In elections for Congress, governorships and state legislatures alike, the number of women who ran outstripped previous years, as did the number of women nominated. Many first-time candidates this year were inspired to run for office, at least in part, by the 2016 presidential election — both the fact that the first female major-party nominee ever lost, and that Donald Trump, who is very unpopular among women (particularly Democratic women), won. In fact, the number of Republican women in Congress, at latest count, will decline in the next session. With the record-breaking group of women elected this year comes a crop of other records and firsts. For example, the next Congress will feature a record number of women of color, as well as a record number of non-incumbent women, according to the Rutgers University Center for American Women and Politics. It will also feature the first Native American women, the first Muslim women and the youngest woman ever elected to Congress. Women swung far toward Democrats this year, but so did men — at least, relative to where they usually are. Which is to say, the gap between female and male voters remained roughly as big as it has been in recent years, according to exit polls. Women were 21 points more likely to vote for Democrats than Republicans in House races — 60 percent voted for Democrats, to 38 percent who voted for Republicans. Men, meanwhile, were about evenly split, with 50 percent voting for Republicans to 48 percent choosing Democrats. That's a big part of the story of 2018: many demographic groups swinging far more Democratic than they did in 2014, a wave year for Republicans. But within the exit polls there are a few more broad lessons about partisanship by gender in America. In other words, even in a year where there's a Democratic wave in the House, white women are about evenly split. This is also roughly in line with 2006, which was another wave year for Democrats. White women were evenly split that year, too. Another important trend from this year's exits (and any year's) is how gender interacts with race and education. Being white, a man, and not having a college degree all are factors correlated with being more Republican. Nonwhites, women and college graduates all tend to vote more Democratic. That can create some wide chasms between groups. White women with college degrees voted strongly for Democrats, by 22 points. White men with college degrees, meanwhile, were evenly split, and whites without degrees voted strongly Republican, according to CNN's exit polls. These breakdowns by education and gender are the sources of some of the most profound demographic shifts in recent American politics. College-educated women, in particular, have swung hard toward Democrats in recent years. Though that swing was already in progress, Trump may have accelerated that trend. Exit polls also showed wide partisan gaps in views of gender. An overwhelming majority of Americans, nearly 8 in 10, said it's important to elect more women to public office. Among those who consider that "important," two-thirds voted for Democrats. Meanwhile, more than 8 in 10 of those who consider that "not important" voted for Republicans. Views on sexual harassment diverged similarly: About 8 in 10 said they see it as a "serious problem," and nearly two-thirds of them voted Democratic. Among those who see harassment as "not a serious problem," nearly 8 in 10 voted Republican. With reporting from NPR's Renee Klahr and Sean McMinn. One of the biggest storylines going into the midterm elections was the record number of women candidates competing in races all over the country. At least 118 women will be in the next Congress. That's up from the current 107. NPR's Danielle Kurtzleben has been following this storyline, and she joins us now. Hey, Danielle. DANIELLE KURTZLEBEN, BYLINE: Hey, Ailsa. CHANG: OK. So give us a picture of what this field of women looked like last night who were running. KURTZLEBEN: Right. Well, you had a record number of women who were running this year. You had a record number who were nominated. And last night, you had a record number who were elected. And the biggest jump there really happened in the House. Right now, at our latest count, 95 women were elected to the House. That's up from the current number of 84. KURTZLEBEN: So that is a really big one-year jump. CHANG: Still not that impressive. KURTZLEBEN: Not - no, it's not. KURTZLEBEN: (Laughter) I mean, right now, 1 in 5 members of Congress are women, 20 percent. Right now, at the current count, next year there are set to be a whopping 22 percent of Congress members who are women. KURTZLEBEN: So even with all this news, it's still not a huge leap. CHANG: How about any historic firsts for women candidates? I know that the first Muslim women were elected to Congress, Ilhan Omar in Minnesota, Rashida Tlaib in Michigan. Were there any other notable firsts? KURTZLEBEN: Yes. There are (laughter) quite a few, actually. I mean, with this big group of women, a diverse group, you're bound to have quite a few. So let's start with Native American women. Two Native American women were elected to the House last night, Deb Haaland in New Mexico, Sharice Davids in Kansas. Both of those are Democrats. You might have a third woman joining them as well, Yvette Herrell. She's a Republican from New Mexico. Her race has not been called yet. Aside from that, you have the youngest woman ever elected to Congress, Democrat Alexandria Ocasio-Cortez. KURTZLEBEN: She got a lot of attention this year. She's from New York. She's 29. KURTZLEBEN: So yes, there are lots of - there was lots of new ground broken last night. CHANG: Well, let's talk about the voters. I mean, we know that all women don't vote the same way. CHANG: So can you offer a little more texture about how you saw women voting yesterday? KURTZLEBEN: ...When really, they are the majority of voters anyway. KURTZLEBEN: Of course they vote differently. So one place to look here is race. You have some really huge racial gaps that go along with these gender gaps and tell a more nuanced story here. KURTZLEBEN: White women, for example, voted roughly evenly for Republicans and Democrats. They were evenly split. Non-white women tended to vote far more Democratic than white women. So you have this really interesting thing happening where, yes, there is a gender gap where white men vote very Republican, white women are evenly split. But non-white voters in general tend to vote much more Democratic than any - than either gender of white people. CHANG: Was that surprising? That's no different than what we've seen in previous elections, right? KURTZLEBEN: No, not at all. I mean, but one thing in terms of things that might be changing is college-educated women. This is a recent demographic shift. Last night, college-educated women voted much more Democratic than Republican. That's not exactly new, but it's new in the last few cycles. And one thing the pollsters have told me is that Donald Trump may have accelerated that. It's a demographic shift that was already happening, but it may be speeding up. CHANG: That is NPR's Danielle Kurtzleben. Thank you so much. KURTZLEBEN: Thank you. Transcript provided by NPR, Copyright NPR.